This past weekend, I had an op-ed in the New York Daily News about the widespread fallacy that population growth and prosperity go hand in hand. Yes, the Sunbelt is growing, and the Frostbelt declining. That decades-old meme was confirmed by the earliest releases of the new 2010 Census. "The quest for mild winters remains the great constant of American demographics," wrote Walter Shapiro in a piece headlined "The Census Ratifies the Sunbelt's Supremacy and Buoys the GOP." "For the first time in history, more than half of the nation's population (308,745,538) resides either in the South or in the warm-weather states of California, Arizona, and New Mexico." But are those states that are adding people also growing economically? Not so much, actually. State population growth does not necessarily translate into higher incomes, notes Harvard economist Edward Glaeser, who points out that median family incomes were $56,200, $60,800, and $56,600 in fast-growing Georgia, Nevada, and Texas, significantly lower than the $83,000, $81,000, and $66,900 found in slow-growing Connecticut, Massachusetts, and New York. If there is one thing that economists of all persuasions agree on, it's that it is productivity growth -- fueled by invention and innovation, increased skills and human capital -- that is the main driver of economic growth and greater prosperity. Higher productivity translates into higher wages and income and improved living standards. So with the help of my colleagues Kevin Stolarick of the Martin Prosperity Institute and Jose Lobo of Arizona State University, I decided to take a more systematic look at the connection between population growth and productivity growth across the 50 states. We found little connection between the two. 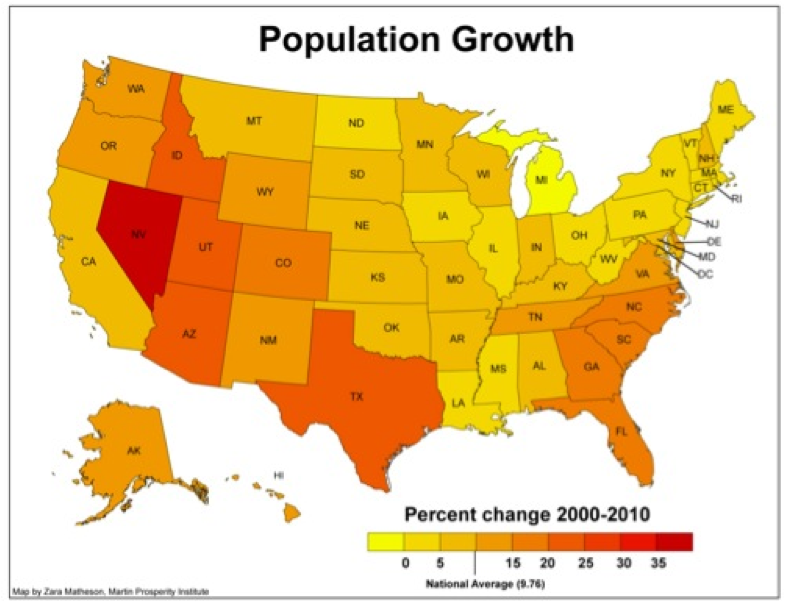 The map above shows state population growth based on the new 2010 U.S. Census. The Sunbelt states (darker orange and red) -- Nevada, Texas, Arizona, Florida, Georgia, North and South Carolina, as well as Colorado, Idaho, and Utah in the Rocky Mountain West -- grew their populations at the fastest clip over the past decade. 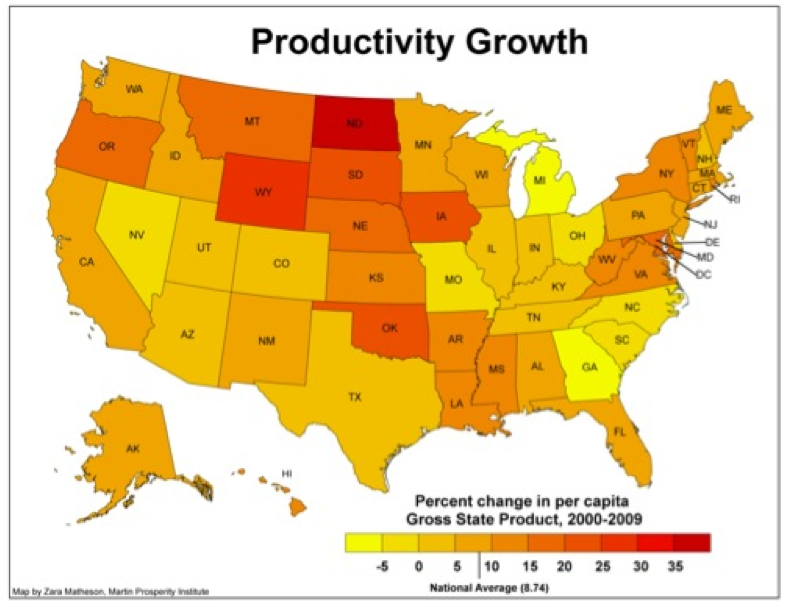 The second map charts the change in productivity measured as gross state product per capita. Now heartland states like North and South Dakota, Wyoming, Nebraska, Iowa, Montana, and Oklahoma as well as Oregon in the northwest and Maryland and D.C. in the east are the top performers, with Sunbelt states lagging. Once-booming Florida is seeing more people move out than move in for the first time. The scatter-graph below puts the picture in sharp relief. Some states that have attracted lots of people have registered meager productivity growth. This is especially true of the booming Sunbelt states that show up in the lower right-hand quadrant of the graph. Nevada, which posted the fastest rate of population growth, posted negative productivity figures. Productivity growth was also negative in the fast-expanding Sunbelt states of Georgia and North and South Carolina. And economic conditions in many of these states have likely worsened as the housing crisis has deepened. 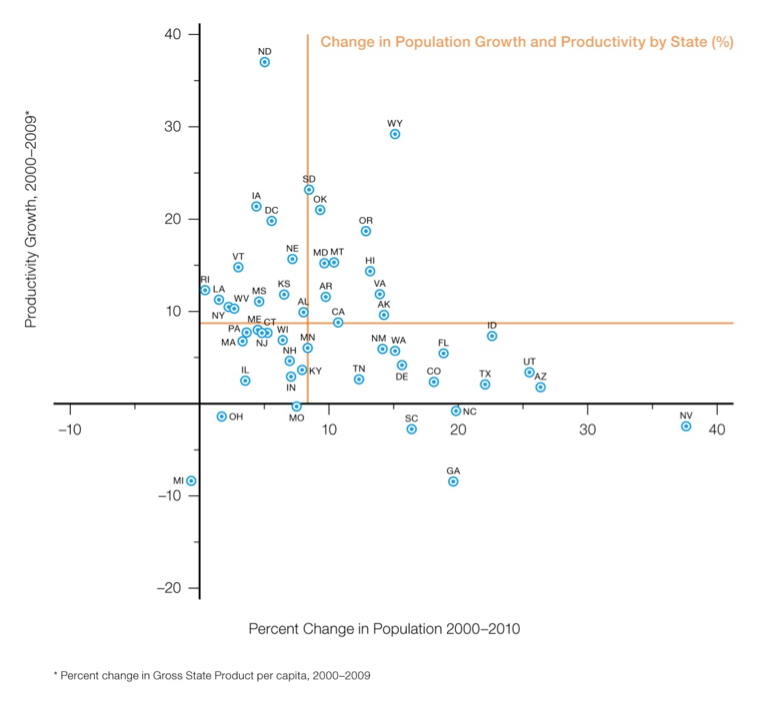 Conversely, other states where population growth has been slow have seen much higher productivity growth. This group, clustered in the upper left-hand quadrant, includes Rhode Island, New York, Oklahoma, Iowa, North Dakota, South Dakota, Nebraska, and Kansas, all of which posted above-average productivity growth alongside below-average population growth. Sadly, there are quite a few states (lower left-hand quadrant) that posted both below average population growth and below average productivity growth. Many of these -- Michigan, West Virginia, Ohio, Illinois, Indiana, Wisconsin and Minnesota -- are in the Rustbelt. But this group also includes several states in New England and the Northeast -- Massachusetts, Maine, New Hampshire and Connecticut and New Jersey, as well as Missouri and Kentucky in the south. These states have been locked in a downward economic cycle. There are just a handful of states (upper right-hand quadrant) -- among them California, New Mexico, Oregon, Washington and Virginia -- that posted rates of productivity growth and population growth that were both above the national average. A booming population might be a sign that people want to live in a place -- because of a pleasant climate, a lower cost of living, or the illusion of prosperity caused by a housing boom. But population growth alone does not suffice to make a state an economic "winner." Later this week, I'll take a close look at population growth and productivity growth in America's metropolitan areas, to see if the pattern holds.